I personally don’t like tattoos. I mean I respect people with tattoos but I would never have one. If you’re one of those people who can’t afford to have a real tattoo, you can now have a fake one added to your image. I’ve encountered a tutorial about it and it’s so easy. 1. Open the image of the person you want to work on. Then open the image of the tattoo as layer and place it on the body part where you want it. Resize and rotate the tattoo as you want it just like the one below. 2. 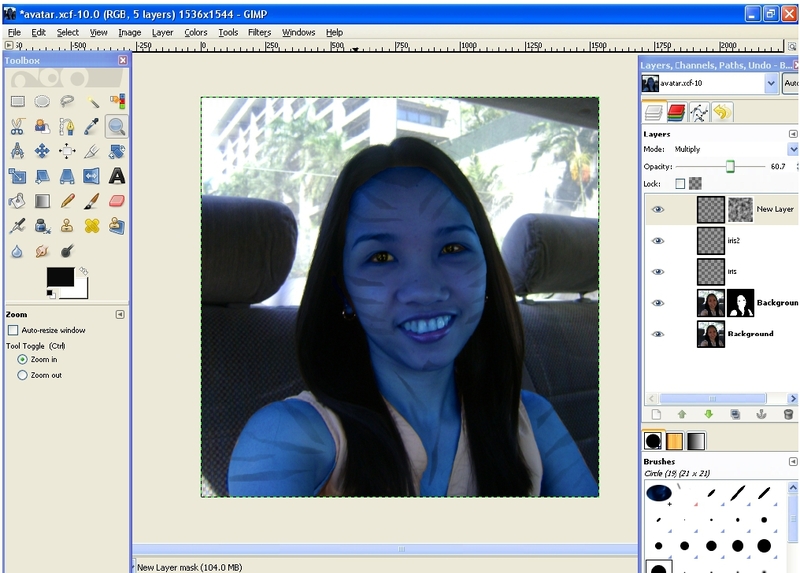 With the tattoo layer activated, select Layer -> Layer to Image Size to make it the same size as the photo layer. 3. 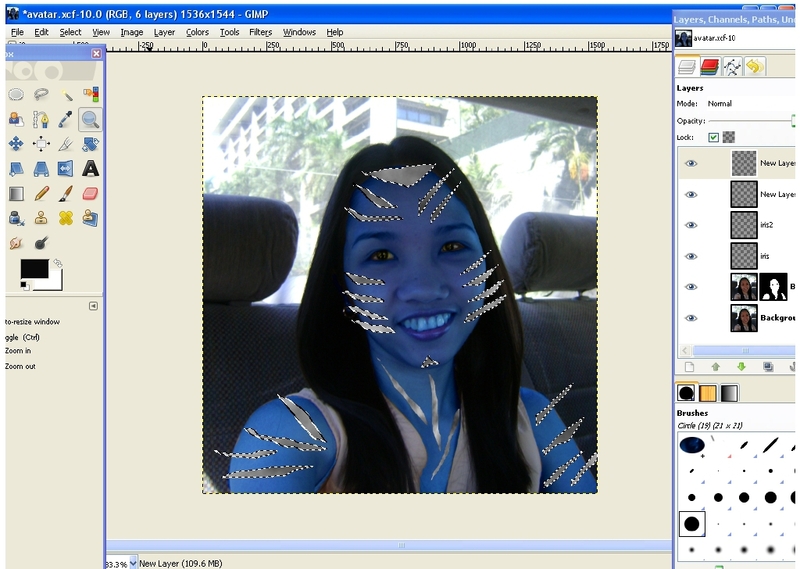 With the tattoo layer still selected, choose Filters -> Map -> Displace. 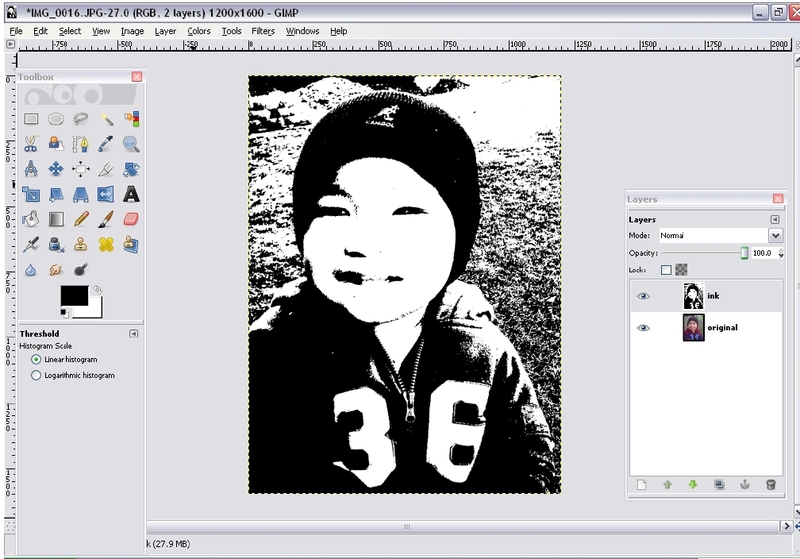 The layer selected in both X and Y displacements should be your subject or the layer that contains the person’s image. I used 5 for both X and Y but it would also depend on your images. Then click OK when you are done. After you’ve done the above, your photo should look like the one below. Look how it holds onto the contours of the nose. 4. 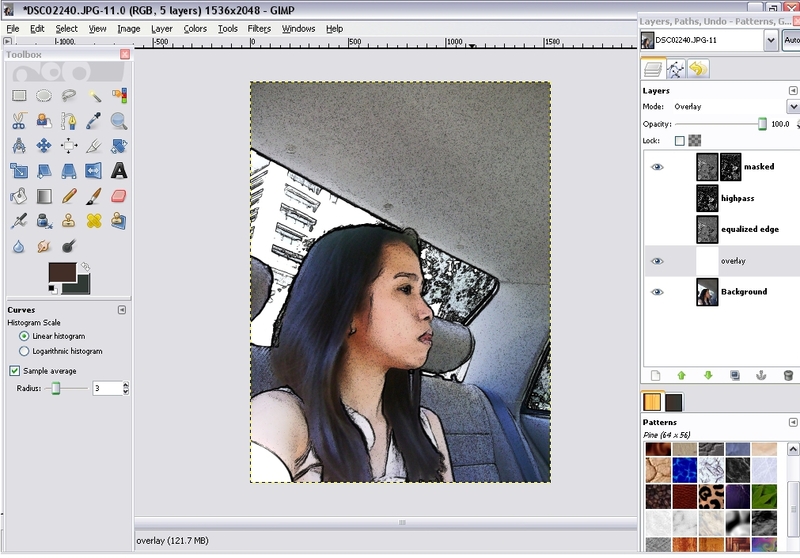 Finally, set your tattoo layer to Multiply mode, adjust the opacity to your liking and we’re done! You may also want to try other layer blend modes and use what you prefers. I found a tutorial that makes adding a shadow so easy. Here’s how it’s done. 1. Select an object or person that you want to have a shadow. 2. Once you’ve opened the image, select the Fuzzy Select Tool. Threshold should be at 15, which is the standard value. Then click the white area outside the bottle. Hold down the Shift key to activate the “Add to the current selection” function and click all the white areas inside the bottle. After which, invert the selection by going to Select > Invert. 3. Click on Edit > Copy (Crtl+C). Then Go to Edit > Paste into. You’ll be seeing a Floating Selection layer in the Layers window. Add a new layer (Layer > New Layer). The Floating selection layer is now a normal layer. 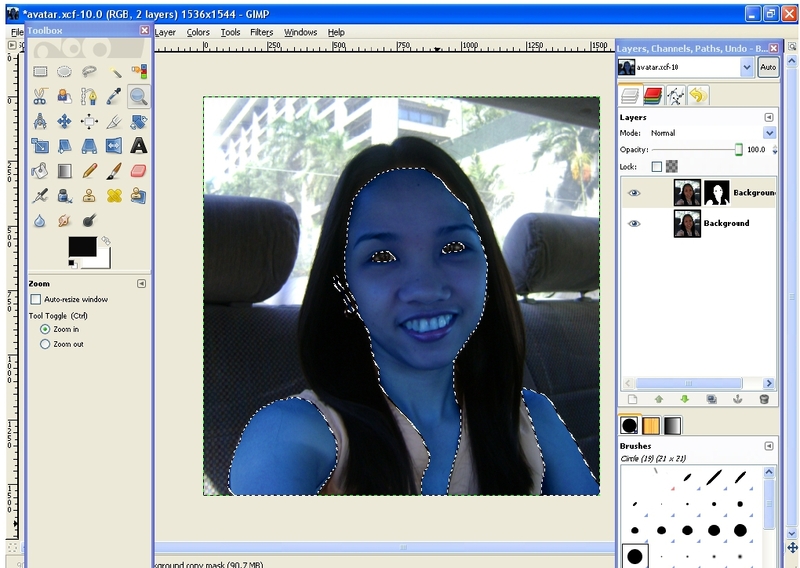 Now you have to duplicate this layer. 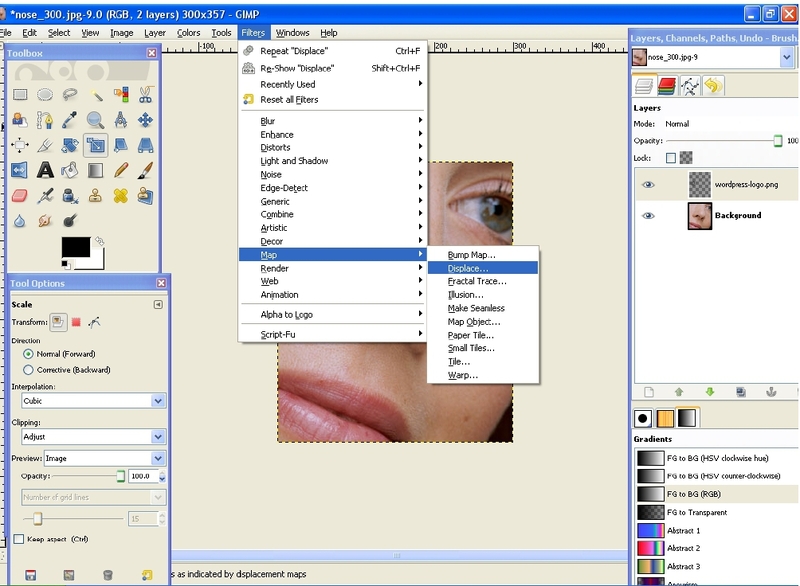 Right click on the layer and select Duplicate Layer (Shift+Crtl+D). 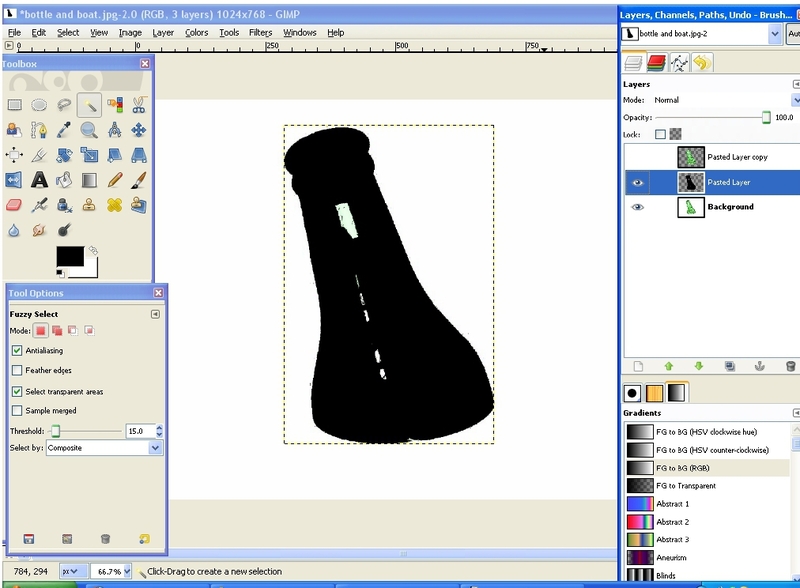 You need those two layers because one of them will be used as the shadow and the top layer will make it look as the shadow is behind the bottle as it should be. Then press Crtl+Shift+A to get rid of the selection. 4. Now we will be doing the shadow. Select the middle layer. Check the Lock Alfa Channel box in the layer window as shown in the image below. Fill it with black by selecting Edit > Fill with FG Color (make sure your FG color is black). You won’t be able to see any changes but if you hide the layer above, you’ll see that you have created the beginning of the shadow (as in the image below). Just don’t forget to make the layer visible again. Then uncheck the Lock Alfa Channel box in the layer window. 5. 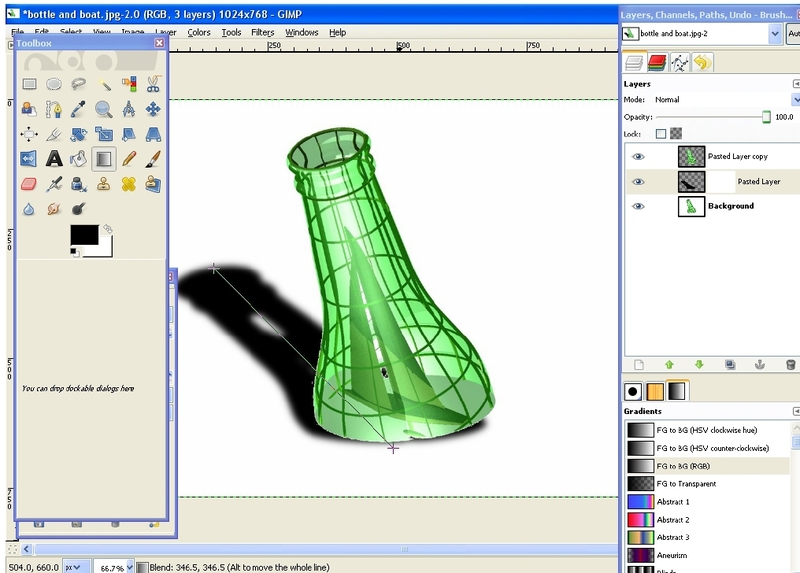 With the middle layer still active, go to Tools > Transform Tools > Perspective. Drag the left and right upper corner down as shown below. 6. Now we will give the shadow some blur to make it more realistic. But before we do that, first go to Layer > Layer to Image Size to avoid having sharp edges on the shadow. Then go to Filters > Blur > Gaussian Blur with a radius of 20px. 7. 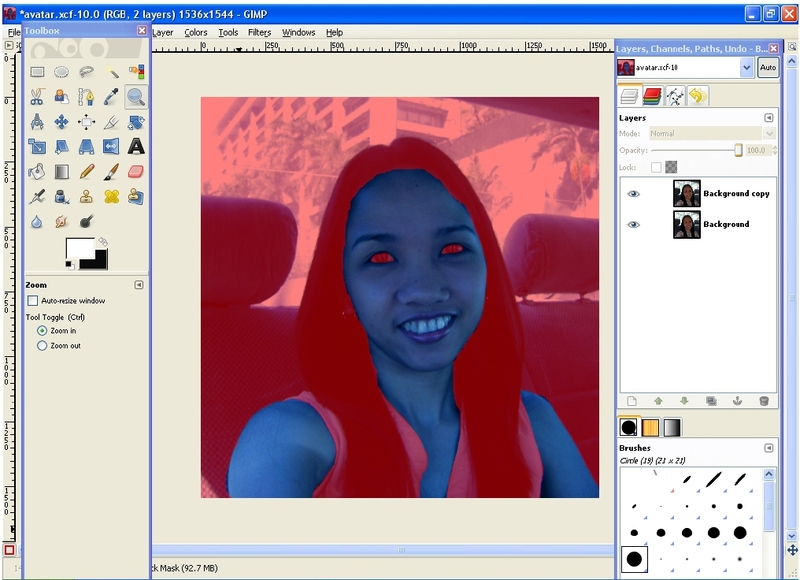 Now to add some gradient to it, select Layer > Mask > Add Layer Mask or right click on the layer and select Add Layer Mask. Then set black as the foreground color and white as the background color. 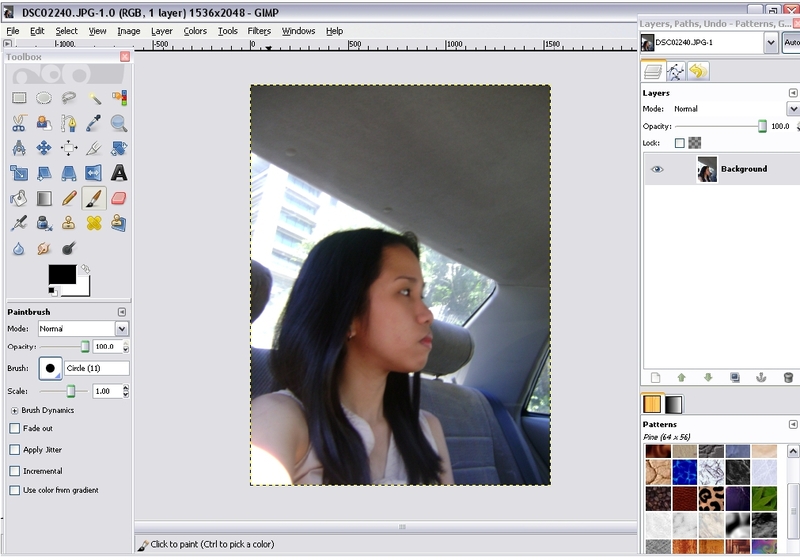 Afterwards, select the Blend Tool and use the FG to BG gradient. 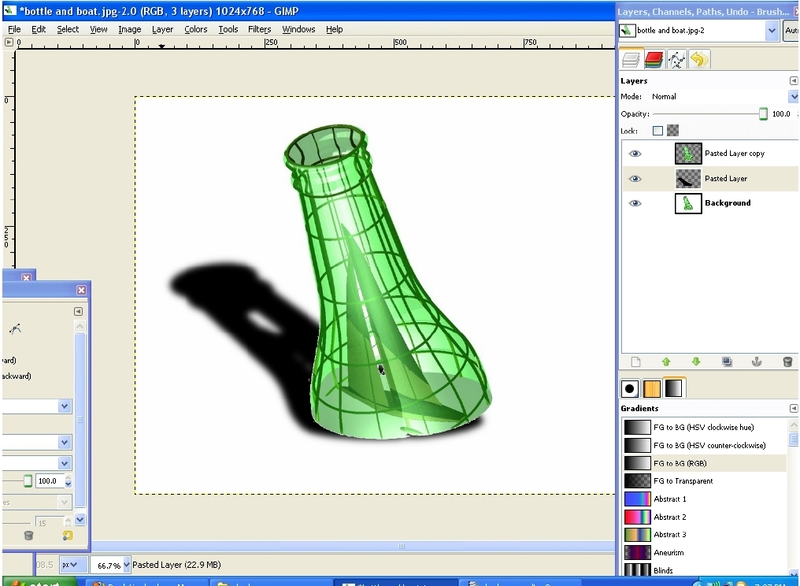 Draw the gradient across the shadow (with the layer mask selected) as shown below. 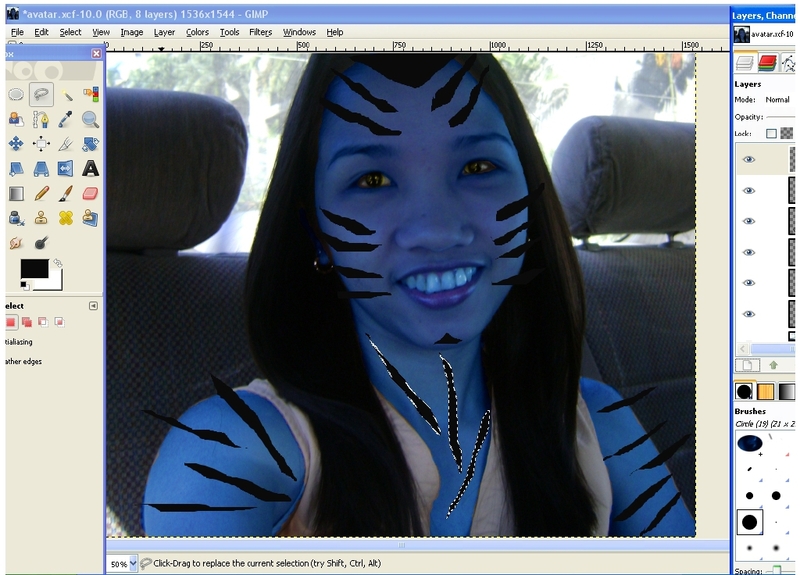 Eversince I watched the movie Avatar, I’ve always wanted to have my own avatar. Alas! I saw a tutorial about it! Wanna make your own too? Follow the steps! 1. Open your portrait picture. I think it is better if it is really a frontal view like mine below. 2. 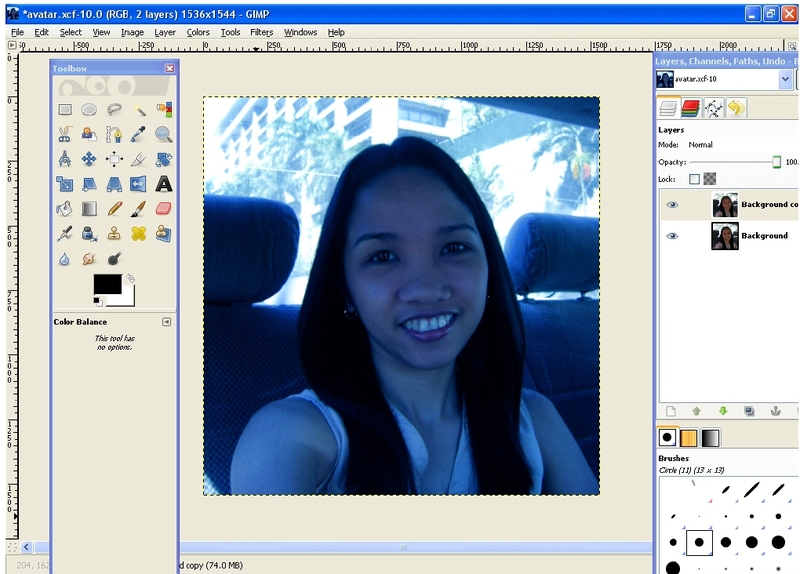 Duplicate your photo and work on the copy. We will have to work on the distortion of the face first. We need to have bigger eyes and make the nose more connected to the eyes. (it was not really effective on my nose though because I have a ‘flat’ nose…haha). Anyway, click on Filter -> Distort -> IWarp. Then select “Move” and change the values to 30 (Radius) and a strength of 0.3. These values are used for an image that is 1000x1000px big. You can increase the radius if you have a bigger picture. Now start at the top of the nose in the middle: drag the parts of the top nose a little to the left and a little to the right. You can work from top to bottom. Be careful not to move too much of the nose into the eyes. Don’t click OK yet as we will also work with the eyes. 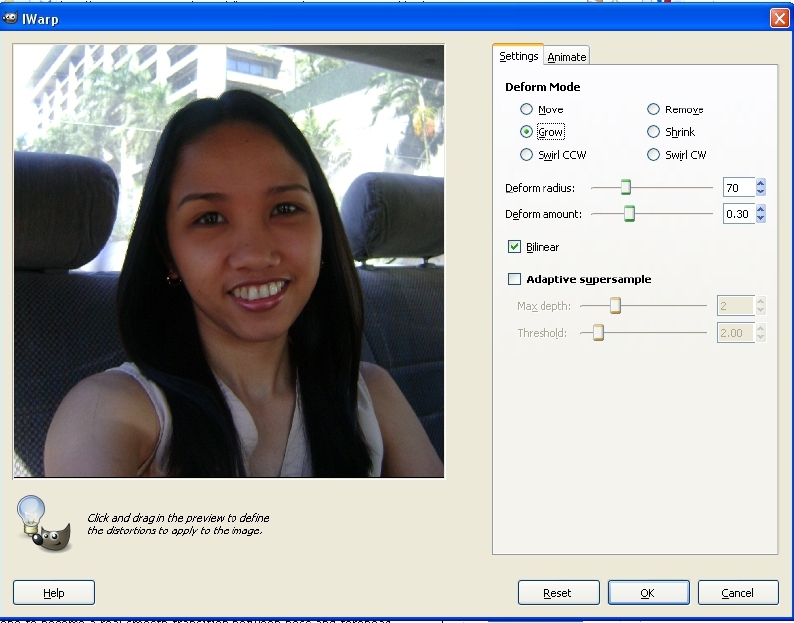 If your eyes became a bit too much distorted, use the “Remove” option in the dialogue (which should still be shown). Drag the mouse slowly over the left eye towards the nose and do the same on the right. Be sure not to move too much to the nose as it may remove your distorted nose. By now the eyes should be looking normal again, we’re now going to make them a bit bigger. Select “Grow” and a radius of 70. Then click the center of the pupils (left and right eye) and click 3 to 4 times, each time the eye should become a little bigger. If you think the nose and the eyes look okay now, then click OK.
3. 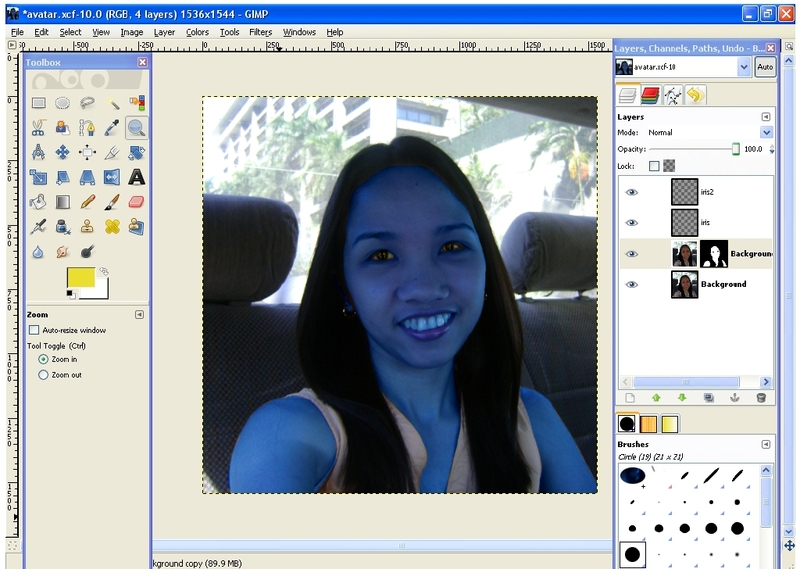 Now let’s work on the blue skin. 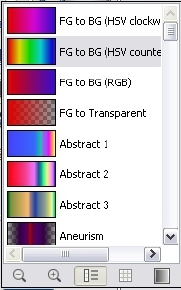 The tutorial that I used exported color values from the Colors / Color balance dialogue. You can download the file here (right click and “Save as…”) and import it using the Color Balance dialogue (click the import-button at the top). 4. The whole picture is colorized. We will have to use a layer mask to bring the original hair color and else back in. Before using the layer mask, we’re going to use the Quick Mask first, where we will paint on a temporary layer using black and white to get a really detailed and nice selection. 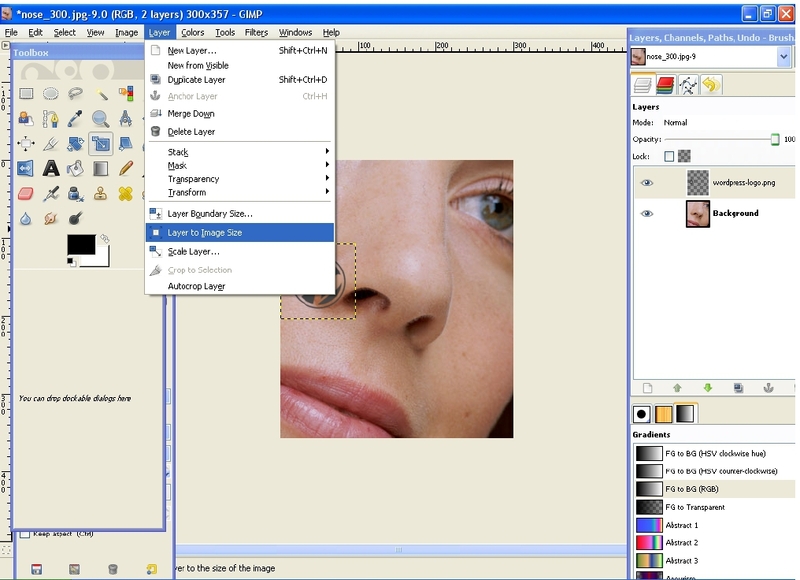 Click the “QuickMask” Button on the bottom left corner of the image window. A red overlay should now show. You can now paint “Black” and “White” to make the selection. Black color (this is the red overlay in the beginning) represents full transparency in the selection and white represents fully selected parts after finishing the QuickMask. 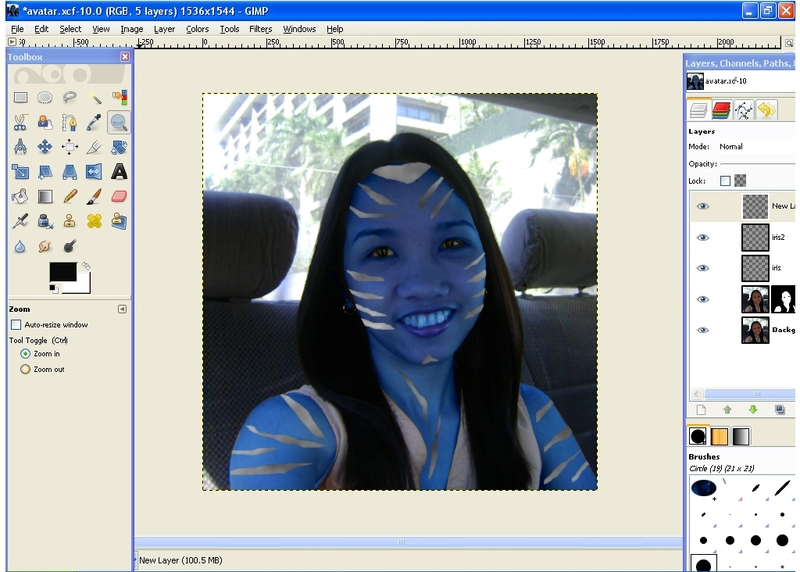 Paint with white using a smooth brush to select the parts that will remain blue, which is the skin part. Then use a smaller brush and carefully paint the eyes with black to make it transparent after we finish the masking. 5. Now click the QuickMask-button again to get a nice selection of it. 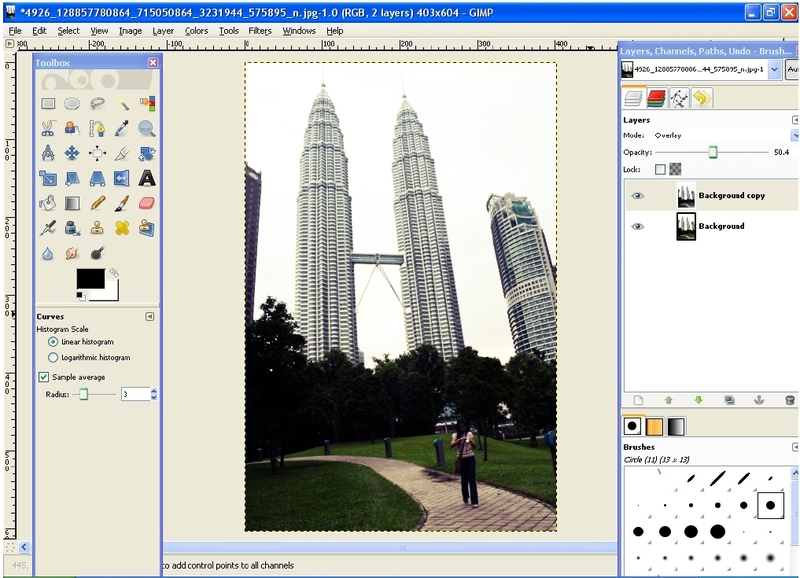 Right click the layer in the layers dialogue and click on “Add Layer Mask”. Choose “Selection” in the dialogue and click OK. Your image should now look like the one below. 6. 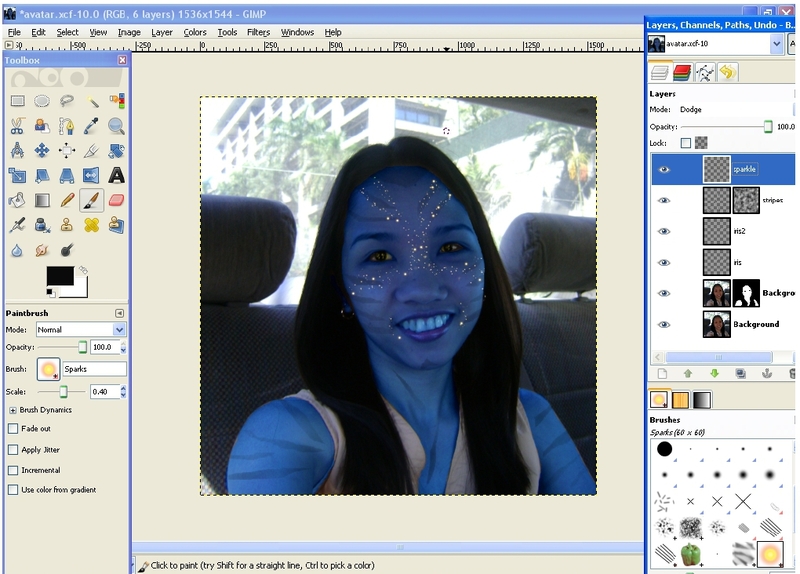 Now we’ll have to work on the eyes to make them more like the na’vi eyes. Choose the Elliptical Selection tool and drag a selection around the iris. Select Edit -> Copy and then Edit -> Paste. Name the floating selection ‘Iris’. The iris is now a separate layer. Then use Colors / Colorize to get a yellow into it. Hue: 56, Saturation: 55, Lightness: 0. Do this on both eyes. 7. Now we will be putting on the stripe like paintings on the whole body. 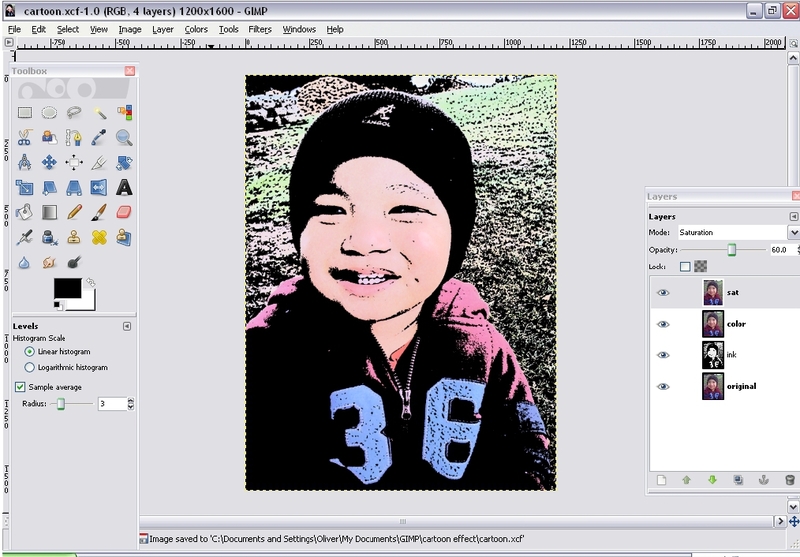 Create a new layer and use the free select tool now to make that kind of painting. Hold shift to add more selections at once. Make sure that you make all stripes in one layer. Once you’re done, fill it with black (Select Black as new Foreground-Color – then do Edit -> Fill with Foreground color). 8. 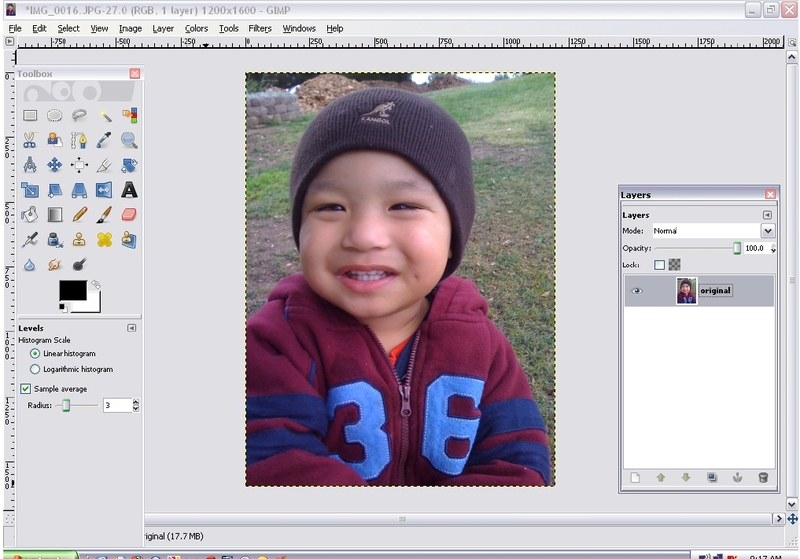 Now, activate the lock-transparency button below the opacity ruler in the layers dialogue. Then select Filter -> Render -> Clouds -> Solid Noise: 0 / 15 (details) / 5.0 / 5.0. 9. Deactivate the lock-transparency by clicking it again. We need to smoothen the ‘stripe’ paintings. 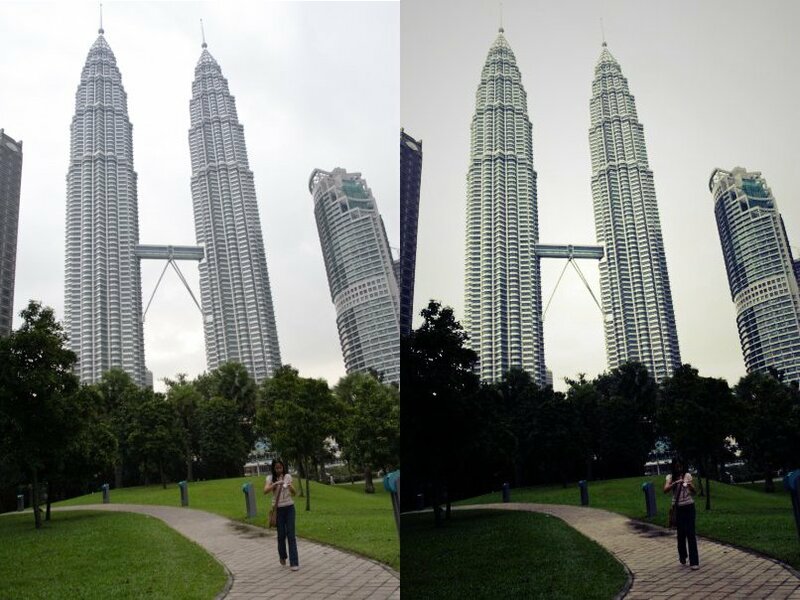 Select Filter -> Blur -> Gaussian Blur: 10px. 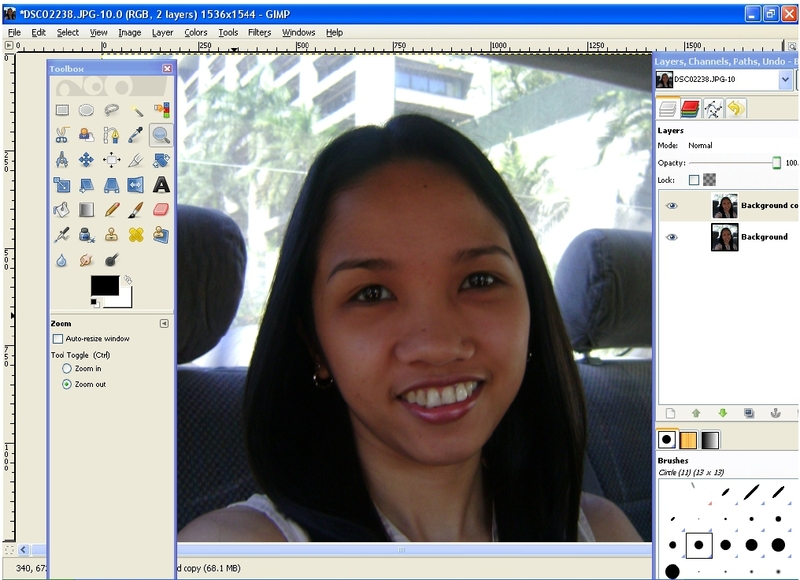 Select the eraser tool and delete overlapping paintings. Now add a layer mask, activate it by clicking it and use Filter -> Render -> Plastic Noise again (Random seed: 0, Detail: 1, X: 7.8, Y: 7.7). 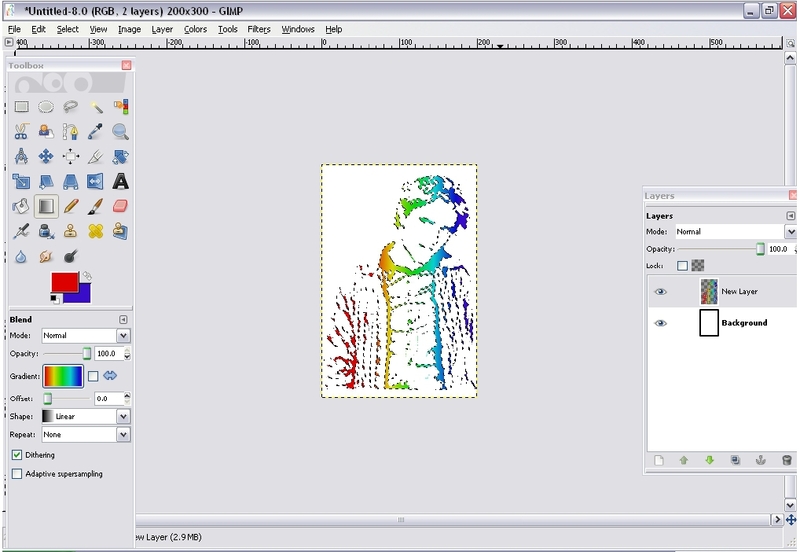 Then set the layers mode to Overlay. 10. Finally we need some sparkle on the face. Create a new layer. 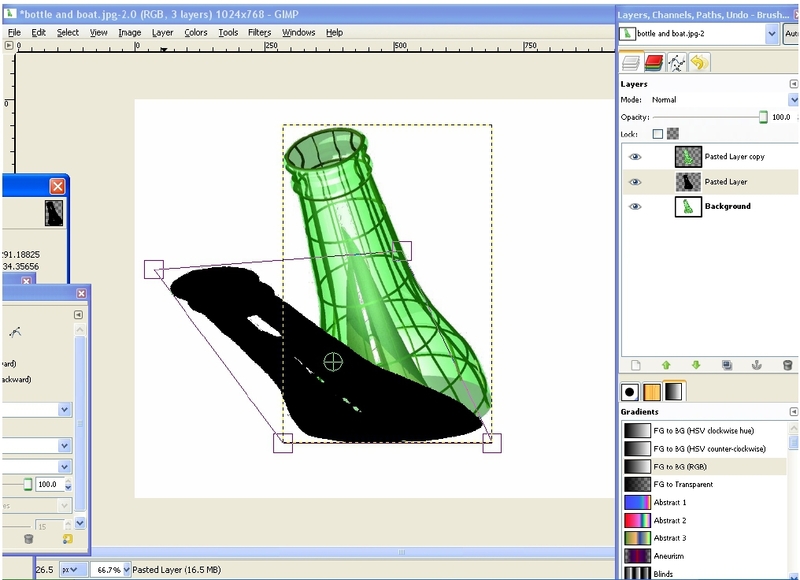 Then select the Brush tool again and use the “Sparks”-brush. Use a small brush scale (0.2 or so). Click on the parts where you want the sparkles to appear. It can be under the eyes, on the nose and on the foreskin. If you don’t like some of the sparkles, you can remove it using the eraser tool. Then set the layers mode to “Dodge”. And we’re done! Thanks to my source! I just learned another cool effect and you can try it too! 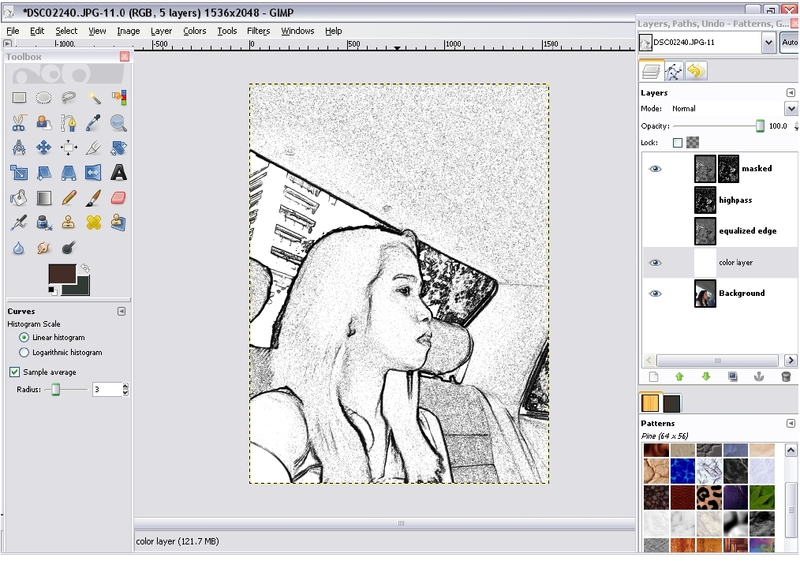 If you want to turn your picture into something like a comic cartoon, then this is the tutorial for you. Tips in choosing an image to work on: choose something that is bright, pictures taken outside would be a better choice, and if you will be working on an image of a person make sure that the face itself has no shaded part. Open your photo and name the layer “original”. 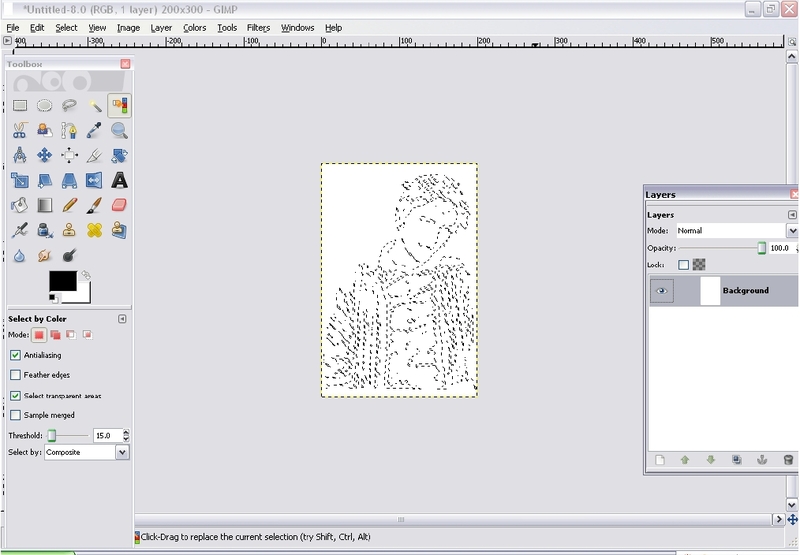 Then duplicate it and name the layer “ink”. Select Colors->Threshold then slide the slider back and forth to find an appealing set of black and until you achieve the look that you want. You don’t have to define the whole image here, just the darkest regions. 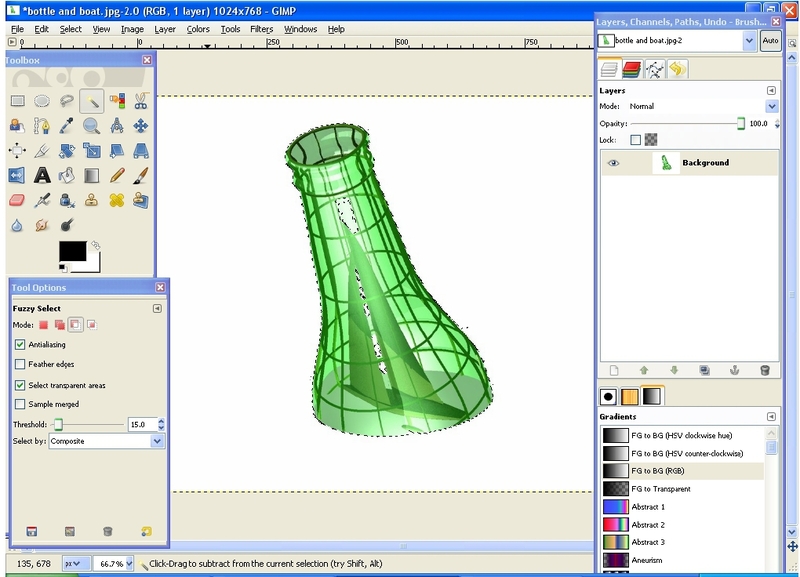 Duplicate the original layer again and move it to the very top of the layer stack. Name this layer “lines”. 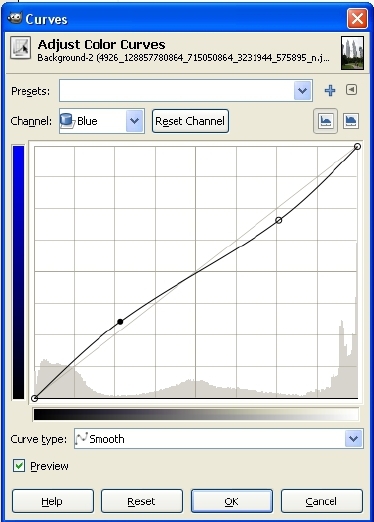 With the “lines layer” selected, choose Filters->Edge Detect->Difference of Gaussians. With Radius 1, higher values make thicker lines while lower values get finer detail. Click on “Preview” to see the effect before applying it on your layer. You may have to undo and try a different value a few times. I used 12 for radius 1 and 7 for radius 2. Your image should look like the one below. After which, select Colors->Threshold again but on the “lines” layer. Your image will go white. Slide the slider pretty far to the right, and the lines will appear. Slide it up to the part that shows a bunch of noisy specks like the one below. Erase any lines you don’t like or regions of noise. 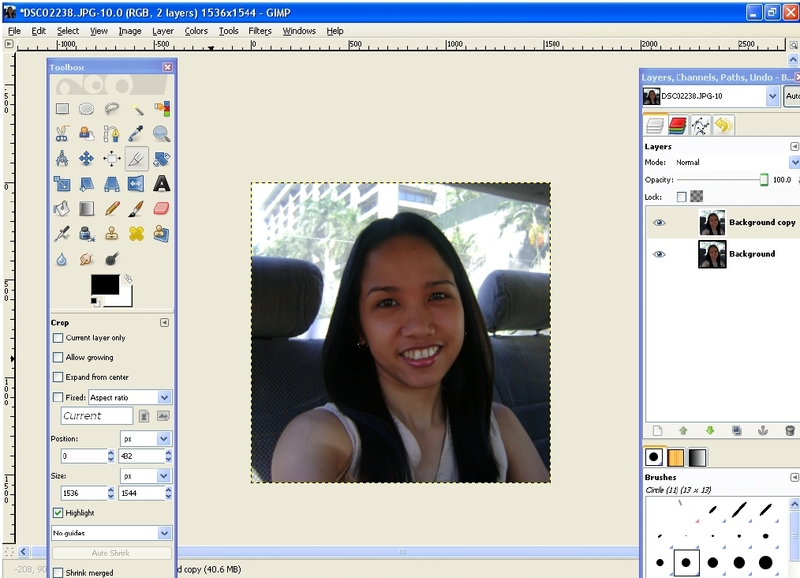 Set the Mode of the “lines layer” to Multiply then right click on the it and select Layer->Merge Down. Choose Colors->Levels and set the Output Level on the right to 240. Now let’s put some color on it. 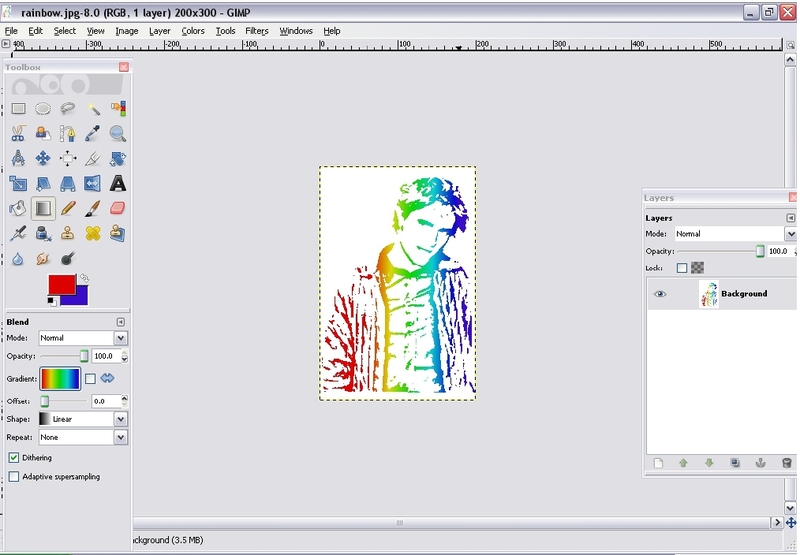 Duplicate the Original layer again then move the new layer to the top of the layer stack, and name it “Color” and set the layer Mode to Color. This will give you very little color. 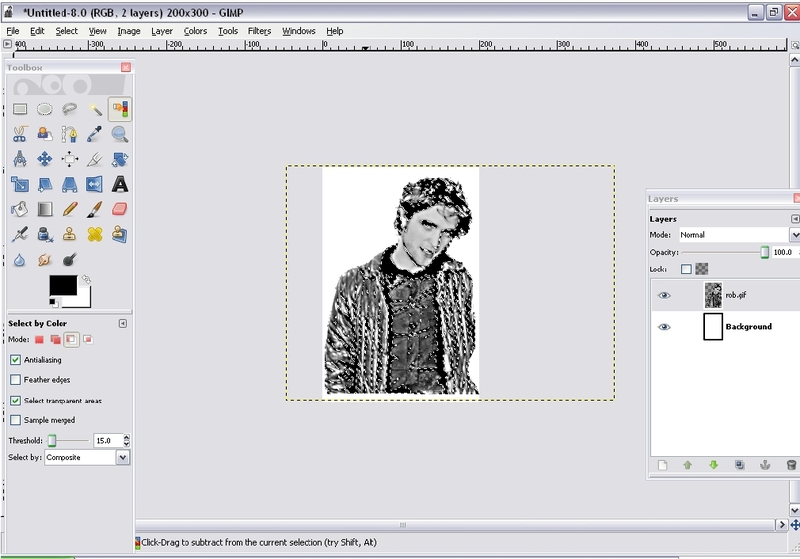 Again, duplicate the Original layer then move the new layer to the top of the layer stack, and name it “Sat”. 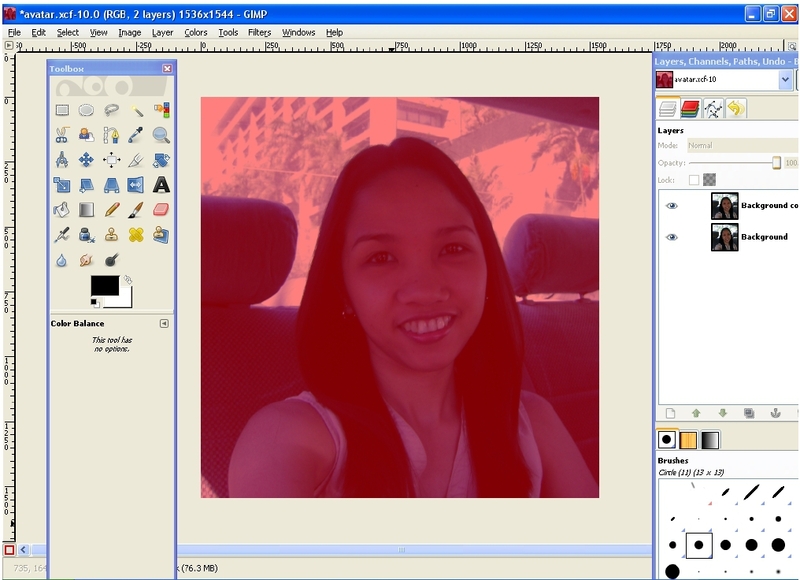 Set the layer Mode to Saturation. Now you have color! You can adjust the Opacity until it looks right. There are times when your image looks like it has a lot of black shadows where there should be a fabric or something depending on the image used. To make that missing part show, we can add a layer of shadow. 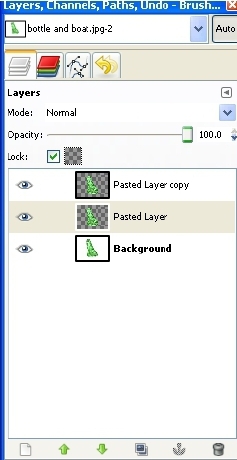 Turn off your Color and Sat layers by clicking on the “eye” icon. Click on your “Ink layer”. 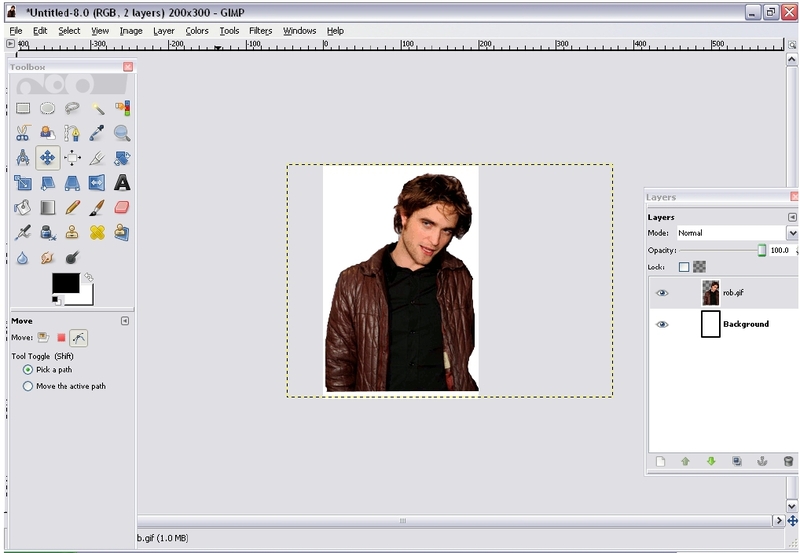 With the Select By Color tool, click on any black part of your image. Then go to the Original layer and then select Copy and Paste. Name the resulting floating layer “Shadows”. 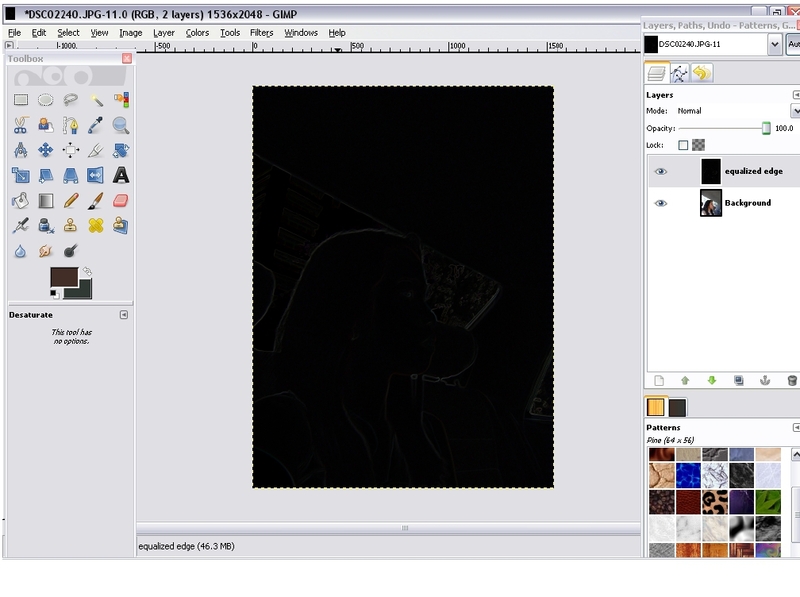 It will have the portions of the original image that correspond to the blacks in your Ink layer. Then choose Colors->Threshold and find the point where you can see the details you’ve been missing. Then select Colors->Levels and set the Output Level on the right to somewhere around 40. Then move that layer to just above your Ink layer and select Layers->Merge Down. Meanwhile, if you want to add lighter shadows, you just need to follow the same steps but you will only have to choose white shades instead of black shades. 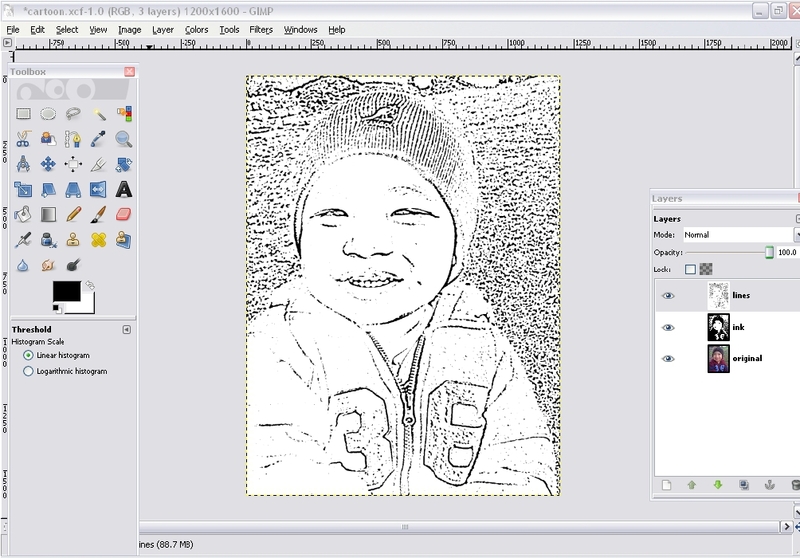 Now, for the final touch, select the “Ink layer” then choose Filters->Blur->Gaussian Blur and use a radius of 1 or 2. 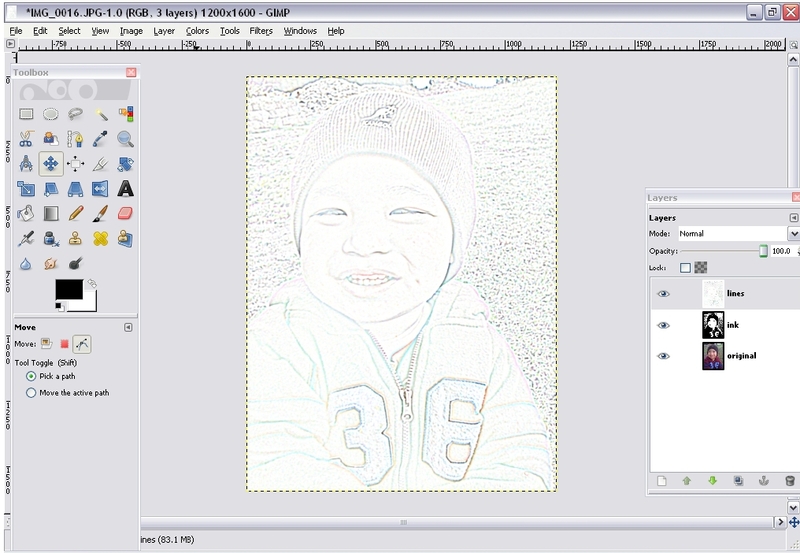 Then on the “Sat layer”, choose Filters->Re-Show Gaussian Blur and use a radius of about 11. And we’re done! I found a tutorial that makes a photo looks like a painted sketch. Honestly, I was unable to achieve his final output but I was able to discover something else. My picture still looks like a sketch but is somewhat different. Let’s begin! 2. 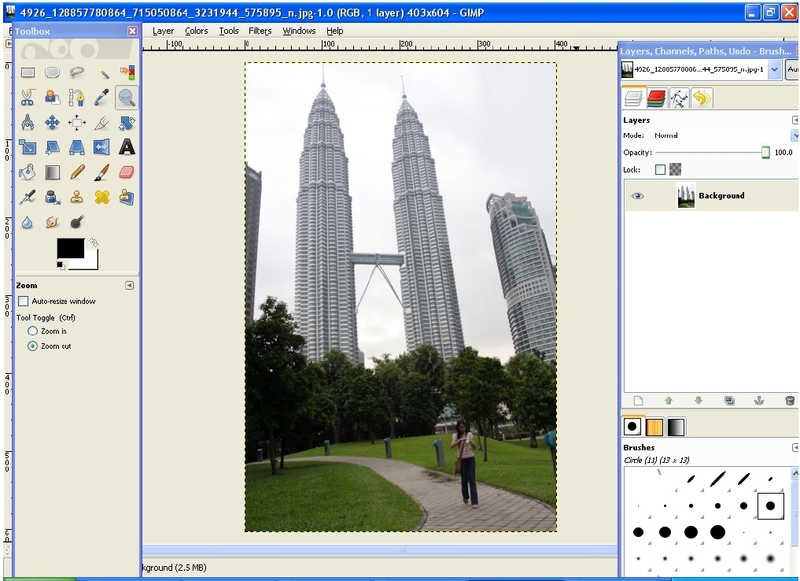 Right click on the original image and select duplicate layer. Then we will apply a Sobel Edge Detect on the duplicate layer. 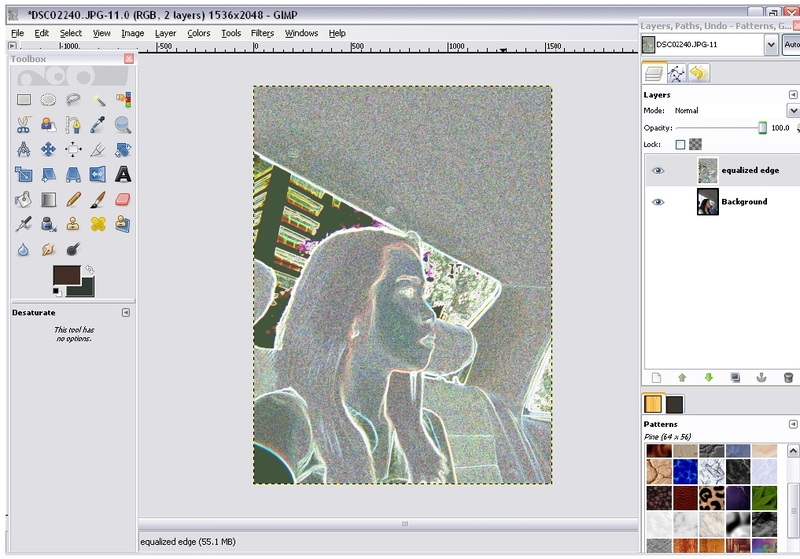 Right click on the image then select Filters -> Edge-Detect -> Sobel. 3. Afterwhich, we need to bring out the detail with the auto-equalize and then convert it to grey. 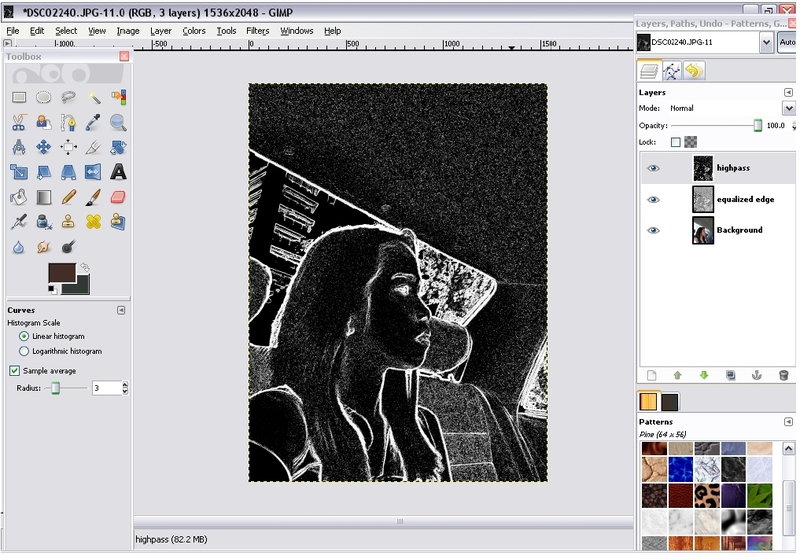 To do this, select Colors -> Auto -> Equalize then Colors -> Desaturate to make it grey. 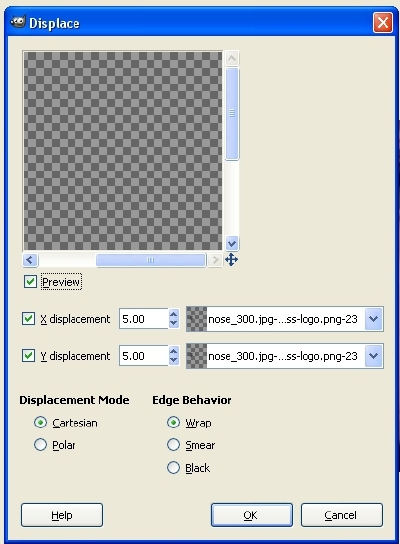 Rename the layer to Equalized Edge. 4. We need to eliminate edges with small magnitude and keep the strong edges. The way to do this is through the Curves tool. 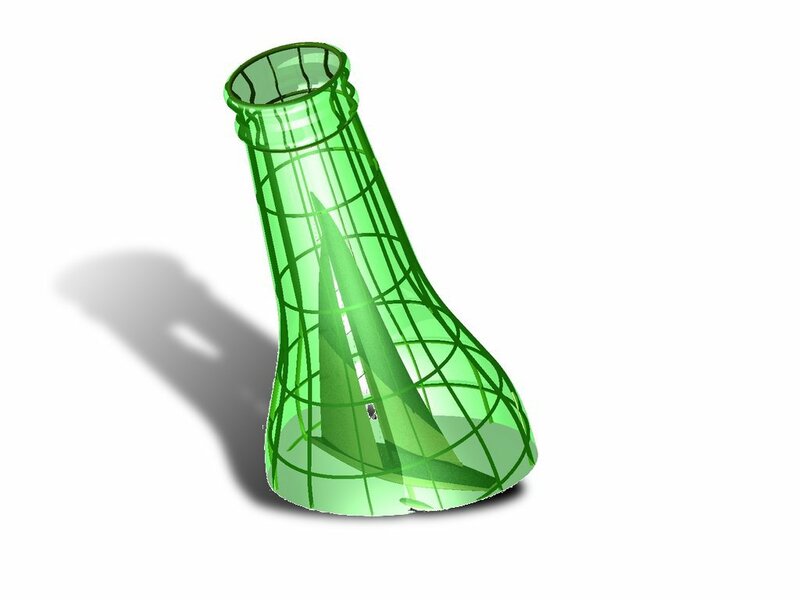 Duplicate the Equalized Edge layer then right click on the image then select Colors -> Curves. 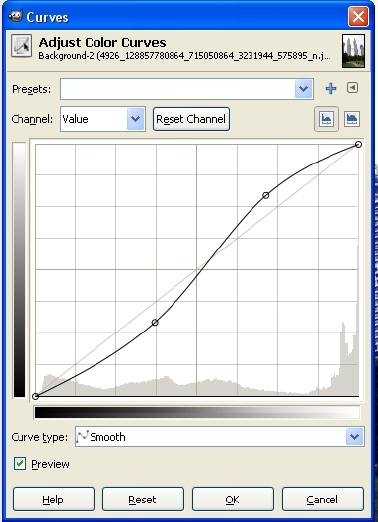 Set the curve type to free (which allows discontinuities), and then for the bottom 3/4 of the curve (or thereabouts) to 0. 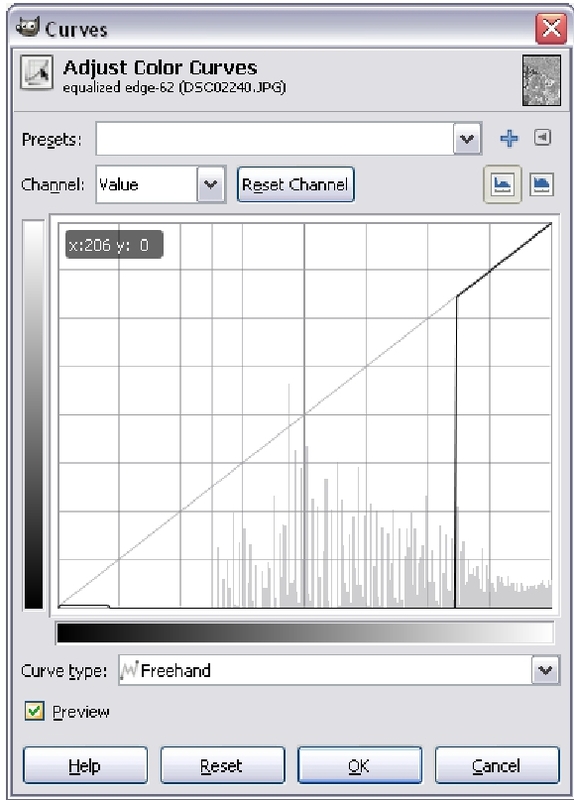 Drag the mouse/pen along the bottom of the curves tool. Rename the layer to Highpass. 5. Then duplicate the Equalized Edge layer and name it Masked layer. Make sure it is placed above the Highpass layer. 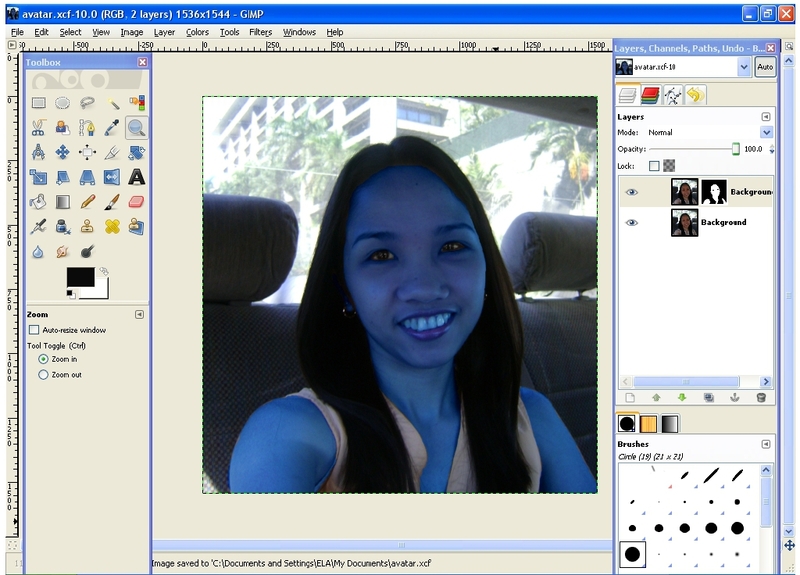 Right click on it then select Colors -> Invert. Select the Highpass layer, click Edit -> Copy. 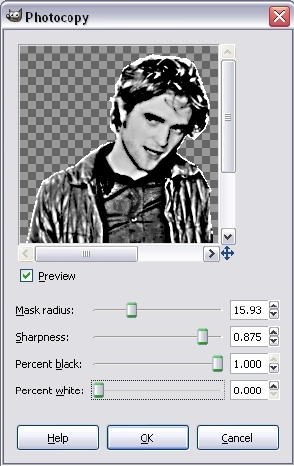 Go back to the Masked layer then right click on it and select Add layer mask. Select the mask and click Edit -> Paste. 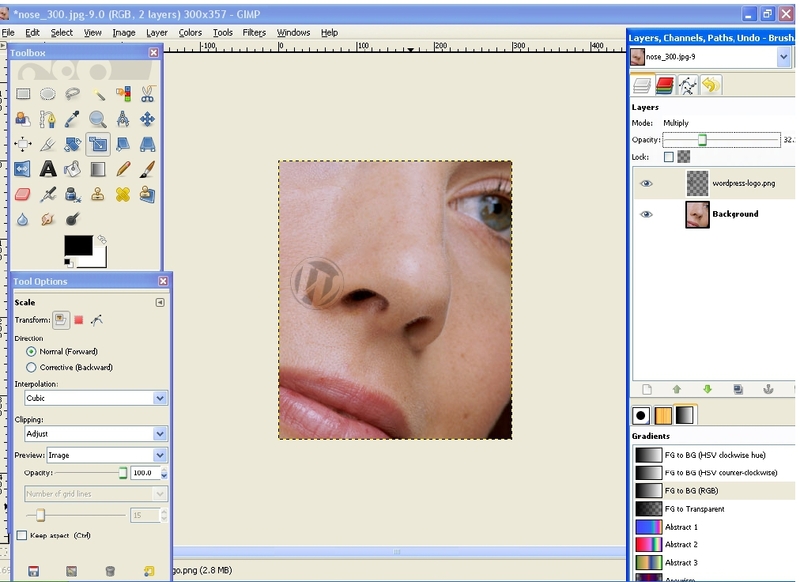 Hide the Highpass and Equalized Edge layers by clicking on the eye icon beside the layers. Your layers should look like the one below. You should have something like the one below. You now have a sketch effect. You can already stop at this point if you already like what you got. 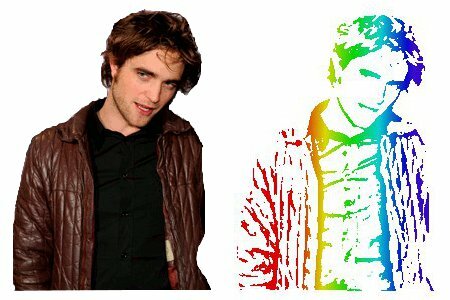 But if you want a colored sketch effect, then add a new layer and place it above your original image. Then change the mode (found above the layers dialog box) from normal to overlay. You should have something like this. So we now have two sketch effects! Hope you like them! 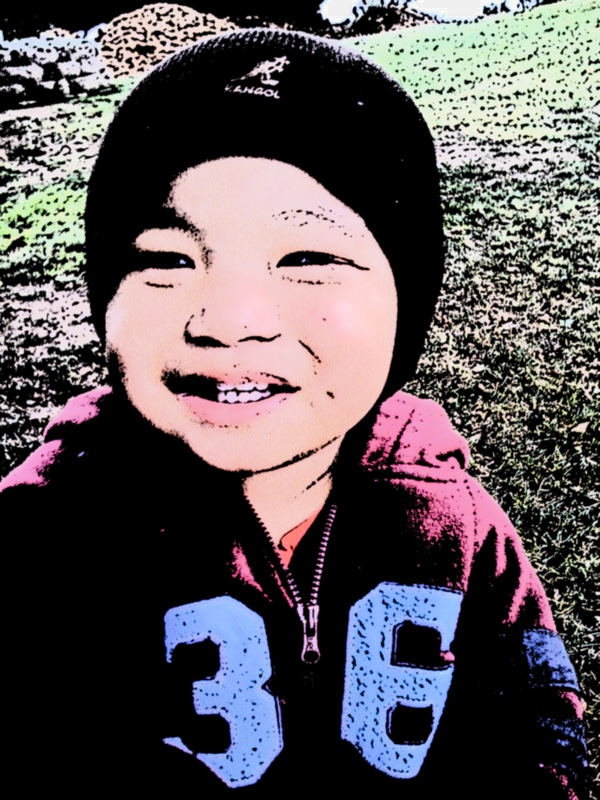 Or you can also have a painted sketch effect from my source.